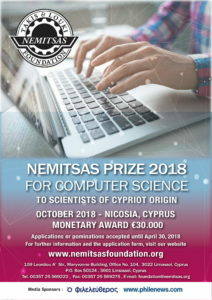 The Board of Directors announces that the NEMITSAS Prize 2018 will be awarded in COMPUTER SCIENCE. Applications or Nominations will be accepted from 1st April, 2018 through 30th April, 2018. Electronic submission (via email) is preferred. A typed A4 letter is also acceptable. To be considered, it must be received no later that 12:00 noon on the 30th April 2018. Attached evidence that the applicant/nominee is of Cypriot origin is required. (In case more that one applicant is selected, the Monetary Award will be split equally among the Laureates).